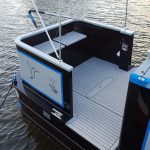 Top 9 Marine Seating Ideas: from custom made upholstery to luxury petite recliners, ideal for canal boats, river boats & yachts. Aqua Furnishings offer luxurious and high quality indoor seating cushions, custom made for your saloon area. Available in many plain & patterned upholstery fabrics, each chosen for their beautiful colour, texture and resistance to soil & stains. All our upholstery fabric has a min of 40,000 Martindale which is is the unit of measurement for the amount of times the fabric can be rubbed without wear. 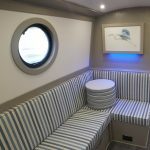 With a choice of fabrics, piping and button additions you can truly make your indoor seating cushion bespoke to fit your boat. If you need irregular shaped seating cushions or would like to contrast the piping and buttons, then one of our sales consultants will be in touch to discuss your requirements further. These are made to the same standard as the indoor seating, however if you’re replacing existing dinette seating we can recreate the same seating measurements as before. For example if your seating area makes up a bed we can recreate the exact mechanism. Furthermore, if you don’t currently have the seating for your dinette, we can measure the area and create cushions for your specifications. Creating a dinette is a great way to be space efficient in a boat. 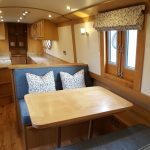 Aqua Furnishings offer luxurious and high quality outdoor seating cushions, ideal for canal boats, yachts, river boats, gardens, festivals, camping and any outdoor area. Available in many plain and patterned outdoor fabrics, each chosen for their beautiful colour, and technical abilities to be resistance to water, sun-fade, soil & stain. The outdoor seating cushion is available in Aqua Quick Dry foam which allows any water to pass straight through it, meaning it doesn’t hold any water inside the product and can dry much faster. The Timeout Chair, is our most contemporary recliner with many design features to make it truly personal. It is a petite swivel chair, with a reclining function and a range of modern bases, making it ideal for narrowboats, widebeams, river boats, barges & cruisers. The covered wooden armrest adds comfort and design to this chair which can be purchased with or without a matching footrest. It is available in over 40 coloured leather fabrics and upholstered fabrics with 2 base designs, plus 4 chair base wood finishes. 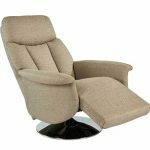 The Ruby Recliner, is our most petite swivel recliner chairs and new to the market in 2017. 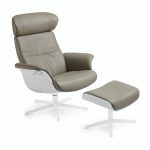 It is available in leather, faux leather and fabric, with a round modern base, making it ideal as a small space recliner. The covered wooden armrest adds comfort and design to this chair which can be purchased with or without a matching footrest. Available in 10 coloured leather fabrics and 10 upholstered fabrics, plus the wooden base is available in 2 oak colours. 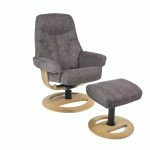 The Ikon Lunar Chair, is a beautifully upholstered swivel chair, with a self-reclining function, adjustable headrest and flip out foot rest. It is one of our heavier chairs due to the flip out foot-rest mechanism, so only suitable for larger boats. This is one of the most comfy chairs on the market, made in the UK with a 5 year guarantee. It is available in over 20 coloured fabrics, 4 base options and 3 sizes. 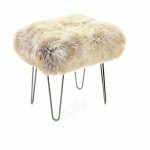 Sheepskin furniture adds style with a smile. Only luxury British sheepskin is used in our sheepskin collection where you can mix and match footstools, poufs, rugs and cushions to create a cosy, soft and tactile element to your boat interior. This products allows a styled, small seating area without taking up too much space due to it doubling up as a footstool. Sheepskin is the perfect choice as wool resists spills, dries very quickly and is mildew resistant. It is naturally fire retardant, resists static, dirt and dust, is hypo-allergenic and sustainable. These are quality pieces of furniture with a real WOW factor! 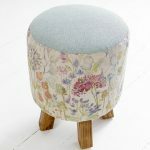 This stylish footstool by Voyage features a beautifully painted watercolour hedgerow floral design. With a duck egg blue fabric top and solid wood legs in a honey finish. Inspired by the Scottish Highlands and Islands, this stool is sure to add a touch of elegance, colour and comfort to your narrowboat. Can be used as a small stool for extra seating. 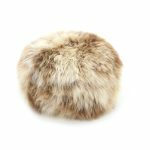 This sheepskin pouf adds style with a smile, use to rest your feet, a small seat or back rest when sitting on the floor. Only luxury British sheepskin is used in our sheepskin collection where you can mix and match any of our sheepskin colours to create a cosy, soft and tactile element to your boat interior.